The San Fermin program of fiestas includes many different shows, acts and games, specifically created with children in mind. 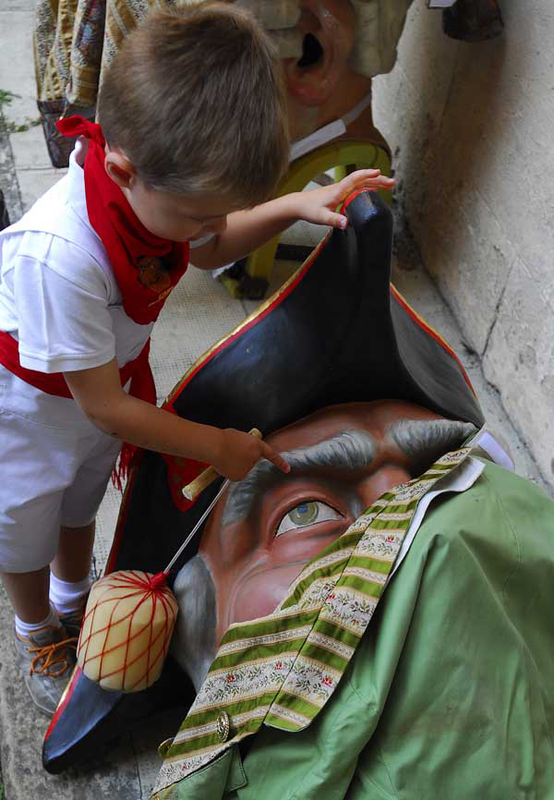 Apart from the traditional daily parade of Giants and Bigheads, and the funfair, for many years now the fiestas program has set aside one day specially dedicated to children: the Día del Níño (children's day). Having said this, the program of leisure activities for children doesn't end there. Children's festivals are organised every day in the Plaza del Conde de Rodezno square, and are generally held at the same time as the bullfight. These festivals are called “Menudas fiestas" (kids fiestas) and offer a range of attractions specifically designed for children of all ages - from 2 year old toddlers to 14 year old teenagers. Open in the mornings and afternoons, activities include children's plays put on in Spanish or Basque, games, inflatables, music and dancing. Special mention should be made of the dearly loved marionettes staged by Maese Villarejo with the adventures of Gorgorito, a Punch and Judy type puppet theatre character which now boasts a tradition of more than 50 years entertaining generations of locals. These activities are all set out in the fiestas program and are also usually published in the local press. The Pamplona City Council is responsible for organising the kids' activities in the Conde de Rodezno square, which is divided up into a number of theme zones. All the attractions organised there are designed to learn through play. There are games, workshops and acts based on music, the circus and adventures. Workshops for juggling, balancing, acrobats, stilts, trampolines, a small rock climbing area, large polyester animals, giant puzzles, are just some of the enticing proposals. The group leaders dress up as all kinds of characters to stimulate the children's imagination and allow them to experiment with sound, rhythm and develop motor skills. Children can either take part in these semi-directed games or, if they prefer, they can play by themselves. It's a good opportunity for mums and dads to enjoy a little peace whilst the kids have fun, taking part in this world of fantasy, although parents can also participate if they want. There's generally a person in the centre of the square to welcome the children and invite them to join in the games, helping any little ones if they get lost. And of course, there are bands to liven things up with their music and concerts and usually a model train for free rides around the nearby streets. The "Menudas Fiestas" kid's play zone is generally well attended, and there can be queues for the different activities. The busiest times are from midday onwards and from 7 pm. To avoid the crowds, it's best to get there before midday or in the early afternoon. It also has one big advantage over the funfair, and that is everything is free of charge, which is a big help to parents when controlling the amount of money spent during the fiestas. The games end at 9 pm, which is when the street show "Paseando" (walking) starts in the Paseo Carlos III. Each day during the fiestas a number of theatre companies take turns to provide street entertainment.